Once you have passed the excruciatingly long lines in front of the Expo and the pavilion, you are greeted with a multicultural musical display. After that you enter an unassuming foyer, where you first receive a plastic fan for a special light display. 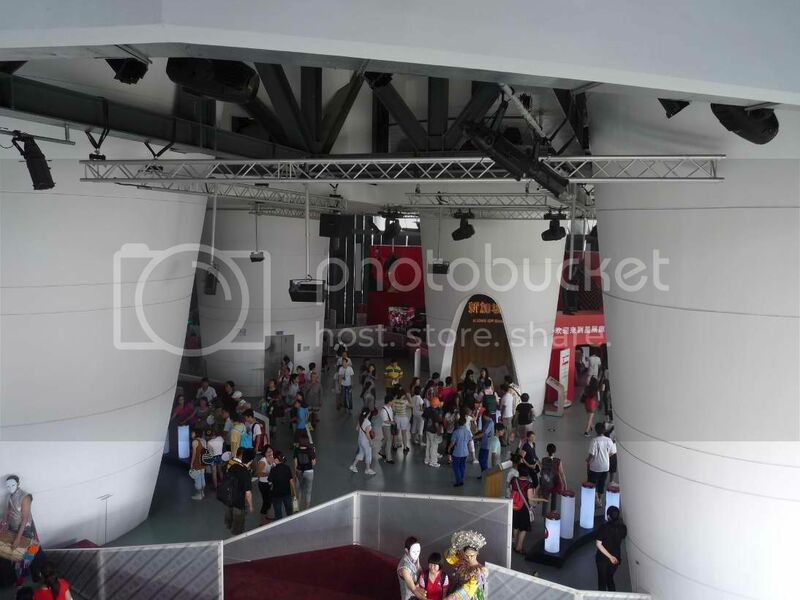 When you hold the fan into the exhibit, you can view various sceneries in Singapore. The small pictures, however, are hardly impressive. Afterwards, you are invited to play on drums and read the many signs highlighting Singapore’s successes and environmental achievements which litter the whole pavilion. Once you have passed the first floor (called “movement”), you once again have to stand in line for at least 15 minutes before being able to get into the second floor. The second floor is a theater with a huge screen (150° widescreen, 2.8 meter high), which displays varying films at different times. During my visit, they showed a small eight minute propaganda film called “City Made from the Sky” narrated by Lee Kuan Yew and displaying Singapore’s achievements in building a garden city. Seeing the aging Minister Mentor towering on such a huge screen was quite an experience. However, judging from the noise level and the early exits of patrons, the movie did not really reach most of its audience, which may have been partially due to the fact that the film was narrated in English with Chinese subtitles. The third floor, my favorite part of the exhibit, was a small rooftop garden with more than 20 different orchids from Singapore. Unfortunately besides being small, it was hardly possible to linger there and enjoy the flowers. While the Singapore Pavilion can compete well with the other pavilions, I think none of the pavilions justifies the long wait in the hot humid climate. Both young and old waited patiently in line to view the exhibit. I was visiting with my in-laws who were not very impressed by what they saw. This was, however, also the case with the other pavilions that we visited. The Shanghai Expo will run until October 31, 2010.